if it's not one thing...oh and a recipe for potato salad? fast forward to last summer...the white picket fencing surrounding the pool area was so old and rotted out that the fence started falling down...this is the fence that protects the pool area from the street...and is there for security and privacy. a couple of times when mose would jump on the fence sections actually fell down. we did some quick repairs but knew it would not last another year...so...this year became the "let's redo the pool fence and decking" project. my husband peter and i collaborate really well regarding home and garden design...and our first set of ideas were presented to the contractor only to receive a bid that was higher than the net worth of some small countries!! o.k., so those plans were scrapped...not in the budget!! 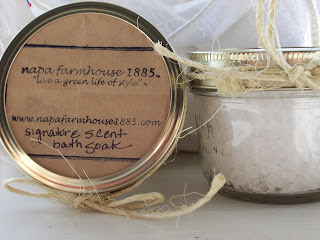 but my life keeps proving that problems really do lead to opportunities...because our revised plans ended up being simpler and more beautiful....eco-friendly...and better suited to our not-grand farmhouse. 1. when it is finished it will be amazing! 3. i am grateful to all the construction workers who are doing a beautiful job..and working really hard. 4. my friend david... the furniture designer for my company...and i are collaborating on a collection of home and garden items...furniture and accessories, crafted from the old white picket fencing...reuse, recycle, repurpose, reimagine!!! cut potatoes into 2 inch pieces. 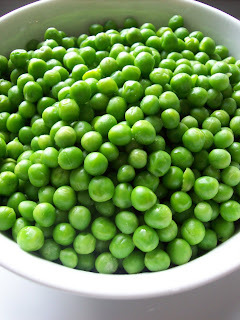 place in a med saucepan add add water to cover by about 2 inches. add a large pinch of salt and bring to a boil. reduce heat and simmer until fork tender...12-15 minutes....begin checking at 10 minutes and ensure you do not overcook. 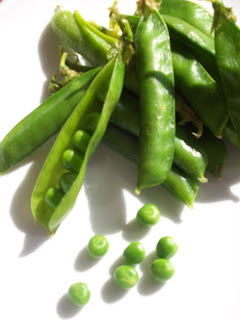 add pea pods to the potatoes after the first 10-12 minutes...fresh peas only need a minute or two in the simmering water to cook. i like them al dente...not mushy. when the potatoes are done, drain into a colander and set aside. 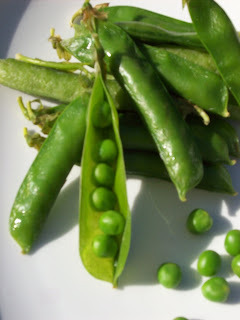 remove the pea pods, shell and add to a large bowl. 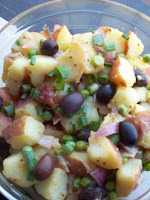 add the potatoes, green onions, red onions and olives. make the vinaigrette by adding the vinegar, honey, mustard and olive oil to a mason jar. screw on lid and shake vigorously until thoroughly combined. add salt and pepper to taste. and...if you have a moment...please share your remodeling horror stories...misery loves company...and just to keep the post theme going...your favorite potato salad recipe! at long last...the limoncello is finished!!! so the memorial day holiday weekend begins in 9 days. 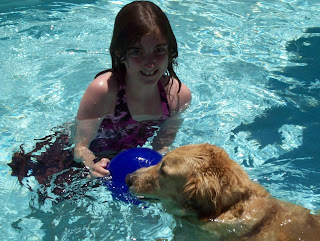 the weather is supposed to be warm...we have nothing we absolutely have to do...and many of our friends have talked about coming to visit...by now, you know how much i love summer...so i am like a kid waiting for the last day of school. and... guess what?...the limoncello is finished and in the freezer. it just doesn't get better than that. 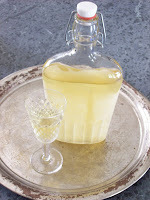 for first time readers of my blog, here is the limoncello background. i first wrote about my love of this liqueur...and shared my recipe...back in february. 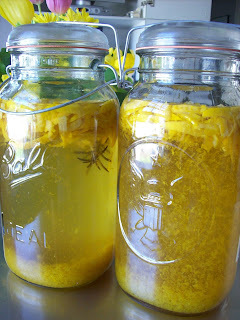 my meyer lemon tree gives us tons of fruit each year...and limoncello is one of our favorite ways to use up the bounty. i explained that the recipe requires 80 days of infusing...and invited readers to make a batch with me...kind of a world-wide group lesson. 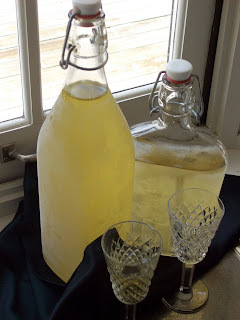 read the first post want some ice cold limoncello this summer? for the complete story and the first step. the first step involves 40 days of infusing. 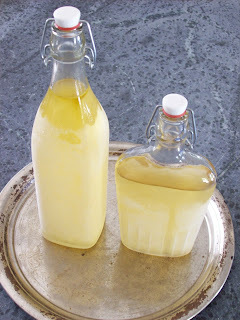 now, i should say that the recipe is easy...just requires patience...and i was very happy to hear that a large group of people signed up to make the limoncello...some posted in the comments section...many more emailed me to share their recipes...or tweaks to my version. 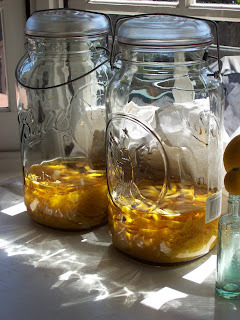 we had a hot debate over using 100 proof vodka (my way) or using everclear...which actually scares me a bit :)... and then, 40 days later, i posted the second set of steps in limoncello, part 2.
that's it...for those of you who made the limoncello with me...please let me know what you think of the final result...for first time readers...it is never too late to start...try to find meyer lemons...i think it makes a big difference in the taste...but if they are not available in your area, regular lemons work well also...the hardest part is waiting the 80 days...so start today..and you will have limoncello the first week of august!!! 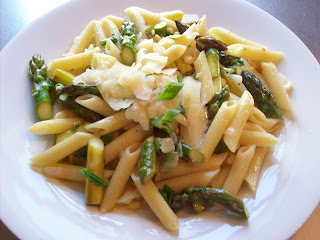 it seems as if i have been eating asparagus non-stop for the past month. i have noticed ...now that i have the opportunity cook almost every day in my "post corporate" life...that seasonal eating just comes naturally. i eat mostly local in-season food and...because once the season is over i have to wait another year...i prepare my favorites over and over again. there appears to be the perfect nature based cut-off...because just as i am starting to get the tiniest bit tired of the fruit or vegetable...the season is over...and it is time for my next favorite! preheat oven to 400 degrees. drizzle olive oil over bottom of baking sheet (with sides)...approx 3 tbsp. 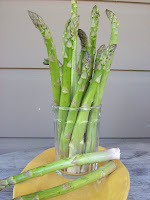 prepare asparagus by snapping off ends and peeling stalks. 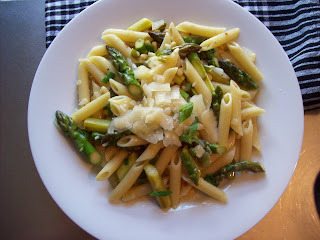 roll the asparagus in the oil to coat. sprinkle with grey salt. 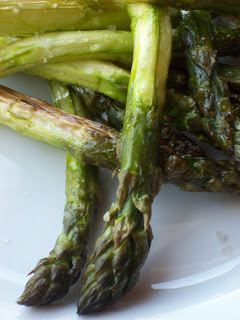 roast in oven 10-15 minutes (depends on how thick your stalks are) until asparagus has just begun to caramelize. serve immediately. peel the asparagus and snap off the ends. 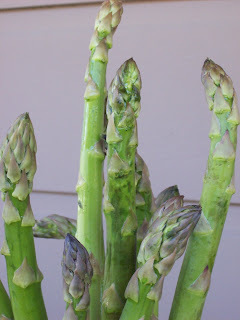 place the asparagus peel and ends, 1 tsp sea salt and 1/2 tsp freshly cracked black pepper in a large stockpot and add the water. cook over high heat until water reaches soft boil...boil for 20 minutes. 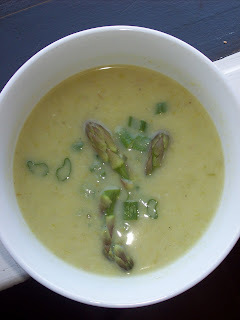 strain asparagus broth into large bowl and discard solids. set aside. roughly chop the asparagus reserving a few tips for garnish. meanwhile, add approx 2 tbsp extra virgin olive oil to stockpot and heat over medium flame. add yellow onions, white part of green onions, garlic, red pepper flakes, chopped asparagus and potatoes and saute until onions are just translucent (do not let brown). at this point you need to puree the soup. you can pour into a blender/food processor to accomplish but i have an aversion to pouring boiling hot liquids into a machine. years ago i bought an immersion blender...one of my favorite tools...and i use this to effortlessly, easily and...safely... puree my soup. i like my soup with a bit of texture so i just puree, but if you want a very smooth soup you can then pour it through a fine sieve into a bowl to strain out the remaining solids. pour back into stockpot and season to taste with sea salt and pepper. 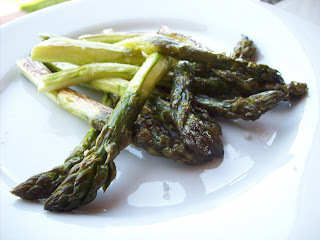 serve hot, warm or cold garnished with chopped green onion and asparagus tips.